This past weekend was a tiring week. On friday, Tony usually hang out with friends or have nice relaxing “date night’ just eating out, walking around or watching a movie. But this past Friday, afterwork Tony and I met up at Burgess Pool in Menlo Park in for a wild night of lap swimming. It doesn’t sound that exciting, btut it was actaully really fun. Afterwards, we headed over to Sportsbasment to buy some bike helmets and prepared our gear and rested up for our first weekend workout with Team in Training. Saturday: I was meant to sleep in on saturdays. Usually I like to sleep at least until 11am..sometimes 1pm. I love sleeping in. But this Saturday, we woke up at 7am and headed over to Spotsbasment in Santa Clara for our Team in Training Run and Bike/Gear Clinic. 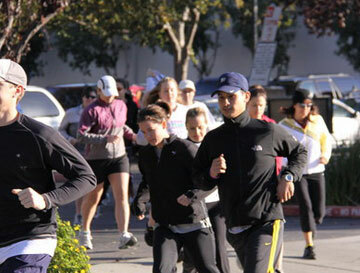 First we did and nice easy 2 mile run, around the Fry’s Electronics area. Tony during the relaxing 2 mile run. 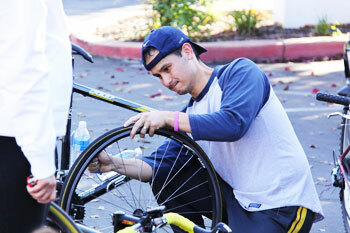 Next, they taught us how to replace a bike inner tube in the event our bikes get a flat. Not like a nice lil demonstration where I expected to watch someone fix a flat, but a sit your bottom down on the aspahlt, grab the dirty tire and strip it with your bare hands. Seriously, they made us learn to take a tire off the bike, strip the tire, and replace it. I had no idea what I was doing. But we did it. Thankfully, everyone was really nice and helpful. It was a slighty dirty, but very good learning experience. Tony learning to replace a innertube. Donella getting much needed help in stripping a tire. Aftwerwards, we had TNT Gear and Bike Clinic & the coaches divided us into 3 bike groups, advanced, middle and training wheels. Guess which group Tony and I ended up? Training Wheels. This was my first race, so any safety tips for riding, was very much welcomed. 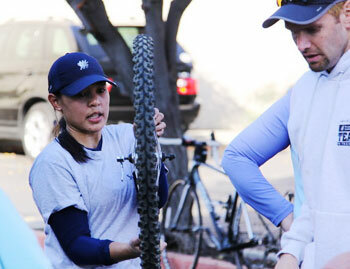 Sunday, Our first team bike ride: We woke up bright and early and met up with about 10 other bikers in Los Altos. Todays ride was an 11 mile bike ride thru Steven’s Canyon. When Tony and I arrived at our meeting location, I was slightly intimidated by all of the fancy gear that our teamates had. Cycling road bikes, cycling jerseys, clipless pedals. They looked like they we apart of tour de france. I felt a bit shy in my regular gym clothes and non-road bike. I didn’t have a bike so my friend graciously let me borrow her wheels (thank you jenn!) When the captain asked if everyone knew how to work the gears on their bike, i was the sole arm raising my hand. After a few minutes into riding, ithe intimidation disappeared. Everyone was really encouraging and friendly, and even gave me few tips on biking and gears. I’m not cyclist and certainly didn’t expect to be ahead of the pack, but the last thing i anticipated was being last. Not only last , but almost so far back that everyone in front of me disappeared. There I was huffing and puffing all the way up the mountain…in 4th gear. When, our captain came back for me, he informed me that it’s better to be at lower gears during longer climbs and inclines and at higher gears while going down hill. And suggested that it would be better to be in 1st gear..level 1. This was amazing news to me. My entire life I was using the gears backwards….I was really glad to learn this and was open all of the coaches advice and reccomendations. This first bike experience was an eye opener….in all aspects of training for this triathlon… I am humbly starting at level 1. The “swim” part of the triathlon is what I most fear. The thought of drowning is oh so scary. But at the same time, it’s also the part that I am most eager and excited to accomplish. Conquering this would be a huge boost confidence booster. Last night was the beginning of my journey to overcome my fear of water. Straight from work, Tony and I rushed to meet up with the rest of our teammate at Burgess Pool in Menlo Park. First part of last night’s training dealt with working on our core. Afterwards, we jumped into the pool. I was expecting the water to be freezing cold. Surprisingly, the pool was heated and was super warm…it was nice. Not as warm as sauna, but nice to the skin. Anyhoo, we were divided into various skill level groups. Tony was placed into the faster intermediate group; while I hung out with the beginners…you know the tadpoles. J/k we did a few drills and I learned a few things that needed to improve on. The coach was clear and explained things very well. Surprisingly, I wasn’t tired by the workout. I was surprised b/k I’m super out of shape and ever since my ankle injury 2 months ago, I haven’t really exercised. Tony said that this is just a ramping up phase. So I shouldn’t get too comfortable. I can’t wait to learn more swim stuff. During our training we had the opportunity to hear from a cancer survivor and honoree. Her name is Vanessa, she was swimming in the lane line next to me. I thought her story was just so amazing and inspiring. She told was that when she was 23 she was diagnosed with Lymphoma: her doctors found a large tumor growing around her heart. She was told that her cancer was untreatable due to its size (10 x 12 x 2.5 cm). Then, she finally found an experimental program that included 9 months of chemotherapy followed by 6 months of radiation. She was told that the odds were quite high that she might suffer long term lung, heart, kidney, or liver damage in the future, but she knew that she had no choice if she had wanted to live. It was a miracle that she survived the treatments and got rid of the cancer several years later, though, some heart damage appeared that resulted in 3 open-heart surgeries. It was at this point that she decided that life was too short to not live every day of your life. She joined the Team in Training program. Then, in 2006 her doctors discovered that her right lung had become paralyzed due to nerve damage from the radiation treatments that she had undergone. Even with all of these challenges she faced decided to join the Lavaman Team in 2007 and completed first triathlon in April of 2008. Last week was our first coached run. We met our mentors and fellow teamates. There are about 80 of us training for the triathlon. It was a nice relaxed track workout where we had the opportunity to get to know one another and have some fun. We also got an update about one of our cancer patient honorees, a little girl named Jensen from Los Altos she has been in the hospital for the past two weeks for treamtment. Her progress is going well and will be able to go home on friday. 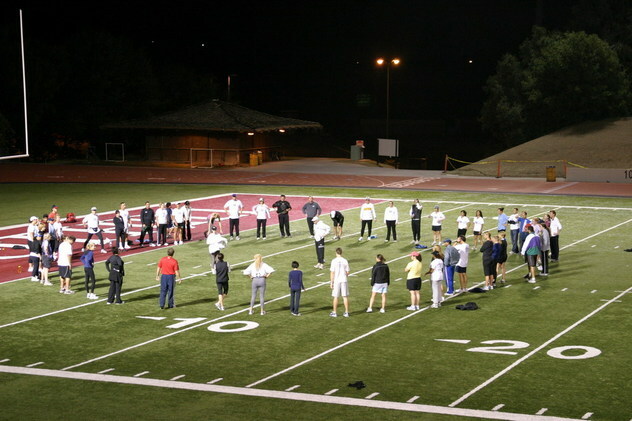 Below is a photo of the group stretching after the run. Hi guys! Thanks for coming to our website. For quite sometime, Tony and I have felt it in our hearts to make a difference not only our lives, but for the lives of others. We’ve searched for activities and events where could volunteer and have a postitive impact on others. Cancer has always been a very important and personal issue that we’ve eager to support. So many individuals within our family and friends have been diagnosed with various types of cancer. When I was younger, I used to think that only “other” people get cancer. Not anyone that I personally knew. But as time goes by more and more people within our circle are getting diagnosed and sometimes losing their battle. In 2004, Tony’s mom lost her long battle with cancer. What started out as breast cancer, spread to her lymph nodes, brain, bone and eventaully to her lungs. It was a very emotionally challenging time for Tony and his family. As it hits closer to home, it fuels our desire to help find a cure and hopefully save lives. We have been inspired by the stories and challenges of current cancer patients and honorees. To do our part and help find a cure, we have decided to complete an Olympic-distance triathlon to raise money for leukemia and other cancers. 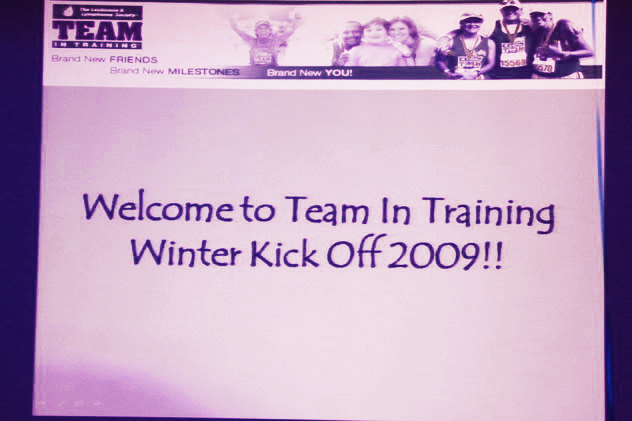 Together we have set some high goals: swim 1 mile, bike 25 miles and run 6 miles in order to raise $10,000 this year. I know you’re all probably thinking I’m crazy. I can barely swim a lap and totally fear the open water. I may not have all the atlheltic abilites, but it’s for a great cause and I have the determination to do it! It’s all heart baby! And to make that happen, we really need your support. In the next couple of months we will be training and fundrasing with fellow teammates from the Bay Area who are all doing this to raise money for the Leukemia and Lymphoma Society. As a team, we hope to raise several hundred thousand dollars this winter – with your help. Donate Now! Check back often and we’ll keep you up to date on our training.